So, you'd like a piece or two of original art that doesn't just decorate your space, but which says a little something about who you are. Maybe not in the deep thinking, philosophical, bare-your-soul kind of way, but which reflect something of the people, places and things you hold dear. Never mind that they seem run-of-the-mill, unremarkable and spectacularly average; familiar items and the sentiment they evoke say something about who we are. Those best-loved sand-shoes, your child's first bath toy, that tree you always climbed as a kid, the iron that rarely seemed to leave your mother's hand... Can you feel the stirrings of personal connection tickling your synapses? These are the primary subjects of my paintings: Small snippets of everyday life from the built and natural environment, in art that you and the people you invite into your zone can understand and relate to. Paintings that create moments of recognition right there on your wall. – That's how you put the Extra into Ordinary. I don’t just paint your art, I can frame it for you too! JUST WANT TO CUT TO THE CHASE and have a quick question answered? Use the form below to email me direct, or try my FAQ page first. View past and recent paintings created in my pocket-sized home-studio. Purchase & enjoy owning your very own painting - or earn serious brownie points by surprising someone with a unique gift of original art. Gather your own background intel on my art, how I paint and what inspires me. It’s hardly high-brow, and rarely predictable - but it’s honest company for your daily cup of tea or coffee. Like me on Facebook or Follow me on Instagram to have your curiosity satisfied with regular social media updates. Wish you could really get the low-down on WHY, WHAT & HOW I paint? Want to know WHERE and WHEN I have artwork on show somewhere? Maybe you’re up for receiving discounts on my art and the occasional free give-away! Hooray! You are truly extra | ordinary! SPAM and I aren't on speaking terms, so I will protect your inbox from junk mail as if it were my own. My news usually hits your inbox a couple times a month, and if that's too much, you can unsubscribe anytime. A portion from the sale of each ‘Bushfire Sky’ print will be donated to charities involved in assisting local Tasmanian bushfire-affected communities to get back on their feet. Love the art, but hold a secret dislike for visiting frame-makers? Consider purchasing your piece in its very own gallery-style frame. From as little as $25 extra, I will frame your art for you, so it is ready-to-display for the admiration of many. I make my frames out of raw Tasmanian Oak timber. 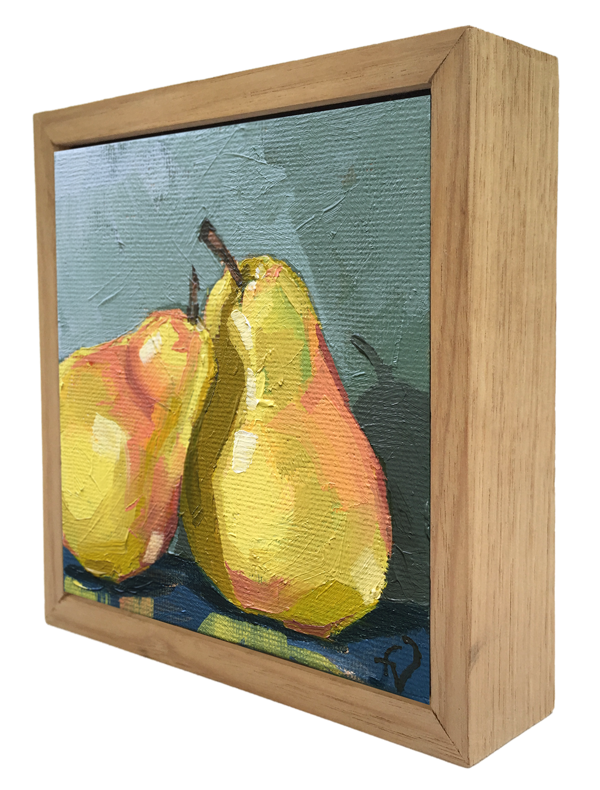 The frames are simple and elegant with a 4mm shadow-line to really make your painting stand out well. Each frame comes ready-to-hang – with D-Hooks and wire in place. 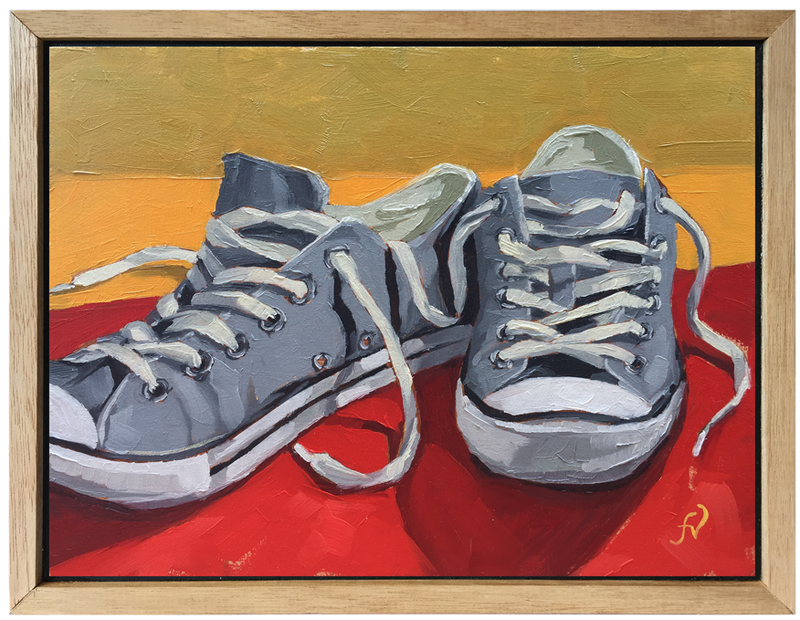 Simply select the framing option when purchasing your painting in my online store.